Most stories about sight fishing take place somewhere like Florida or the Bahamas, where the sun is shining and it’s warm outside. This story took place in Manitoba’s Parkland region, a world class destination for stillwater trout. Don’t take my word for it, however, since Manitoba is my home province. Type “Manitoba Parkland fly fishing” into Google and see what comes up! Besides those in the story, there are many spectacular lakes nestled in and around rolling forest and farmland. Did I also mention that Manitoba is not well known for a warm climate? It was mid-October when I rolled up to West Blue Lake. The car’s dash display said it was a balmy 2 degrees outside. Before you think that this is an article about ice fishing, I live in Canada, and that’s 2 degrees Celsius, or about 35 degrees Fahrenheit. Nevertheless, I was bundled up under untold layers, including my secret weapon against the cold – neoprene waders. I climbed into the pontoon boat and started rowing away from the dock down a narrow channel. The sky was dark and cloudy but I was actually feeling pretty warm. In a couple minutes, the channel opened into a small bay. A couple boats were tucked into one corner of the bay and enjoying some decent action. I kept my distance and tested the rest of the bay. I had on a brown marabou leech and an intermediate line. There were all kinds of deadfall along the shore that screamed for a cast and retrieve. After about 5 minutes, the sky opened up and a tremendous load of snowflakes pelted down… And kept pelting down. I couldn’t even snap off a picture without a flake clouding up the camera lens. I felt like I should have been skiing. Or at least chopping down a Christmas tree. Nevertheless, I kept casting and after a minute or two, I was rewarded with a beautiful, sturdy brook trout in full fall colors. I actually started to think it was quite normal to be fly fishing in a snowstorm. The lake was long and narrow and I fished my way to its far end, trying several spots. All my different flies, retrieves and line sink rates were ignored. By the time I was rowing back it had stopped snowing. The forest around the lake looked like it came from a calendar that featured scenic landscape shots – except it was a December picture and not an October one. I turned into the bay and noticed the boats were gone. I had heard them talking about a false spawn so I coupled an egg imitation with my intermediate line. Darkness was less than an hour as I stealthily kicked my to way where they had been. And I almost slid out of my pontoon boat when I peered into the water. It was 5 or 6 feet deep, incredibly clear, and alive with trout. 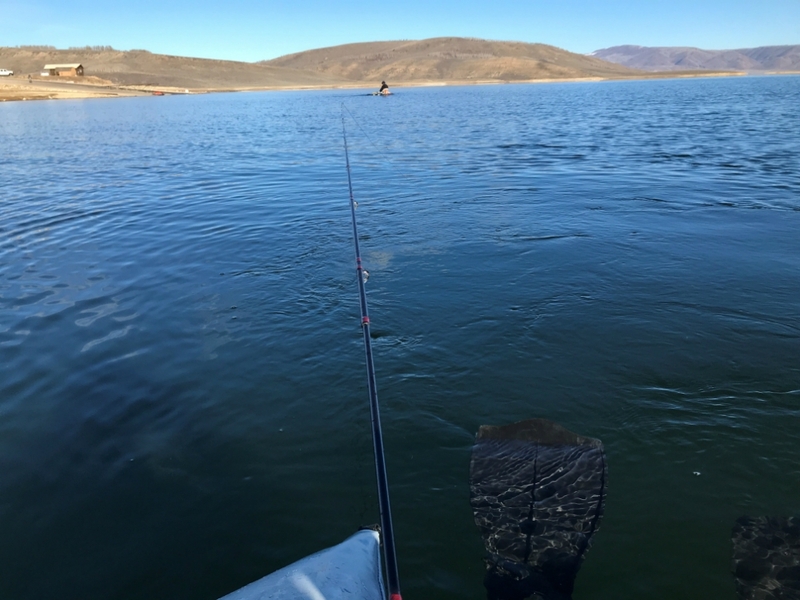 Although the lake is regularly stocked and supports almost no natural reproduction, the bottom was gravel and the trout were sure trying hard. There was a band of partially submerged trees right against the shore and where the trees ended the gravel began. It was a fairly narrow strip, perhaps 20 feet wide and 40 feet long, and it held dozens of trout. Most were respectable 12 to 15 inchers but there were a few real brutes down there. I cast my fly to a small pod about 20 feet away and let it sink. Fish on! A beautiful 13 inch brookie came to hand. Then I lost another. And then nothing. Out of dozens of fish, only a couple seemed to have food on their mind. As twilight settled in, I rowed my way back to the car. 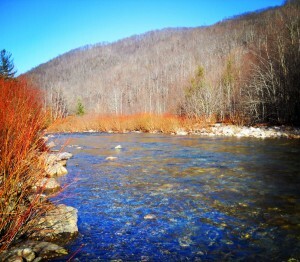 The next week, I forced myself to drive past all those trout milling about in the clear water. However, before the season ended I wanted to chase big splake, which is a lake trout/brook trout hybrid. Laurie Lake, which was just down the road, has a reputation for holding some of these exotic monsters. I had on a big, black marabou leech. Splake have apparently inherited a lake trout’s appreciation of large meals. My fourth cast landed quite close to the shore of the island. After a couple strips my rod doubled over and throbbed. 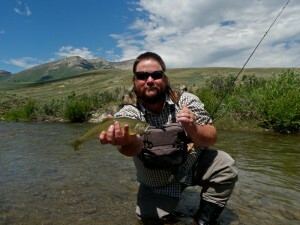 It was not the frantic dancing of a small, nimble trout. This was the deep, steady power of a real bruiser. Grudgingly, a 23 incher slid into my net. Its colors were every bit as striking as the brookies from the previous week. Boat – Something like an Outcast Stealth Pro inflatable pontoon boat is amazing for the bigger lakes. Oars help you cover water and fins help you get your casts tight to reeds and deadfall. It fits into a hatchback car and is pretty quick to set up. Don’t forget an anchor and a couple of Pro Pockets! On smaller lakes, I have to admit that I love popping an already inflated Fish Cat tube out of my car and just hopping in. Rods and Lines – I used to head out with one rod and 3 different lines. But quickly realized that actually changing a spool in the middle of the lake is not going to happen. Now I carry 3 different rods with 3 different lines and I am ready for pretty much anything within the 30 seconds it takes to stow one rod and grab another. One outfit is a 6 weight rod with an intermediate line like Rio’s AquaLux II. This outfit is great for tossing scuds, water boatmen, and small leeches in the top few feet of the water column. It is also indispensible when there are weeds just underneath the water’s surface. The second set-up is a 7 weight with a Type 3 line like Rio’s Deep Series. This lets me fish larger leeches and minnow patterns among deeper submerged weeds and deadfall down to about 10 feet. The last outfit is an 8 weight with a Type 6 Outbound Short. Naturally, it is for scratching deep drop offs and I have been known to dangle a large perch-like Deceiver from it to tempt meat-eating browns. Because I am usually casting the 6 and 7 weight rods at some kind of target that isn’t too far away, these rods have the gentler action of a TFO Professional II or Echo 3. The 8 weight is for booming out long casts with a heavy line and something like a TFO BVK or Echo Boost gets the job done. Reels – In Manitoba’s Parkland, the chances are quite a few fish will wind up on the reel and the big ones can definitely uncover the backing. Personally, I am very comfortable with reels similar to a Lamson Liquid, Echo Ion, or Redington Surge – all these have a solid, smooth drag and leave enough money in your account for a guide when you go to Florida to warm up.